Baabwaa is a sheep who loves to knit. Wooliam is a sheep who loves to read. It sounds a bit boring, but they like it. Then, quite unexpectedly, a third sheep shows up. A funny-looking sheep who wears a tattered wool coat and has long, dreadfully decaying teeth. Wooliam, being well-read, recognizes their new acquaintance: the Wolf in Sheep’s Clothing! The wolf is so flattered to discover his literary reputation precedes him that he stops trying to eat Baabwaa and Wooliam. And a discovery by the sheep turns the encounter into an unexpected friendship. David Elliott is the award-winning author of many books for children, including And Here’s to You!, illustrated by Randy Cecil; In the Wild, On the Farm, and In the Sea, all illustrated by Holly Meade; and Nobody’s Perfect, illustrated by Sam Zuppardi. David Elliott lives in Warner, New Hampshire. Melissa Sweet has illustrated nearly one hundred books for children, including Caldecott Honor Books The Right Word: Roget and His Thesaurus and A River of Words: The Story of William Carlos Williams. She is also the illustrator of Firefly July: A Very Short Year of Poems and Some Writer! The Story of E. B. White. Melissa Sweet lives in Rockport, Maine. Written by David Elliott, this hilarious romp shares a timely and powerful message — that even our enemies can become friends when we discover common threads and common stories. Melissa Sweet’s outstanding art is whimsical and playful. Elliott's tale is cleverly humorous and a joy to read aloud. Sweet's illustrations in watercolor, gouache, and mixed media are a stellar accompaniment...The characters are all highly expressive, and the graph paper and strands of yarn in the page design add to the nonstop merriment. Great for knitters, for readers, for fun-seeking adventurers. Elliott’s droll sense of humor generates lots of laughs—“It says here I’m cruel and sneaky!” complains the wolf after learning how to read. “And your point?” responds Wooliam—which Sweet (Some Writer!) capitalizes on in mixed-media scenes that embody the simultaneous dopiness and intrepidness of the sheep, as well as the wolf’s mix of menace and vulnerability. An off-kilter adventure with charm to spare. With illustrations created in watercolor, gouache, and mixed media, this picture book is sure to hold the attention of early elementary children...A fun modern take on the big bad wolf. The colorful visuals warmly convey the drama and excitement of the enjoyable text. 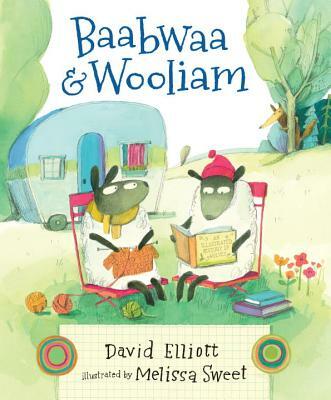 David Elliott’s ever-so-clever tale of two sheep, Baabwaa & Wooliam (ages 4 to 8), has the makings of a classic...The story’s droll humor is underscored by Melissa Sweet’s illustrations, which have bold touches of color and smart details (check out the nifty trailer the sheep call home). Here’s hoping Elliott continues the adventures of this wonderful, woolly pair. This humorous tale features two wooly friends who love knitting and reading. While searching for an adventure, they must learn to work as a team when they find a wolf in sheep's clothing—literally. This is an amusing delight because of both the tongue-in-cheek voice (“Knitting is a very practical hobby for a sheep. It’s surprising not more of them do it.”) and the sprightly mixed-media art...Underpinned by a love of reading (and knitting), there’s plenty to enjoy here. Sweet’s colorful and expressive illustrations, done in watercolor, gouache, and mixed media, add to the fun of this entertaining tale of an unlikely friendship. The playful multimedia illustrations perfectly match the lighthearted, droll story that's a tribute to reading.